I committed to being an artist twenty years ago. I started off primarily as a black and white photographer working in the dark room which then evolved into sepia tone prints and hand-tinting. The next door that opened was in the mixed-media arena when photography evolved to working with digital photography and mixed media explored a variety of mediums. What (or who) has been your biggest influence in terms of defining your own style, technique, etc? I have always been fascinated with storytelling in the arts. Julia Margaret Cameron was one of my first great influences on realizing the impact of "storytelling" through the photograph. I had the privilege of taking workshops from both Joyce Tennessean and Jerry Uelsman both of whom opened my eyes to the world of exploring "storytelling" through the imagination and manipulation of the print. Gerard Richter's exploration on his play between realism and abstraction was a strong influence of another season of expression for me. Several years ago, I had the privilege of seeing a Shepard Fairey show, which transformed my imagery even more than I could have imagined and introduced the power of words to my work. What is it like being a professional artist living and working in Tennessee right now? I have worked in the Tennessee area for the past 20 years. One of my highlights was working with Tennessee's Bicentennial in 1996 opening a feature show, "Haunting Memories : Echoes and Images of Tennessee's Past," at the Tennessee State Museum! This gave me an on-going relationship with Nashville. It toured for one year throughout the state of Tennessee and finally came back to my hometown, Knoxville, TN, and was featured at the Knoxville Museum. Working today in the Tennessee area is rewarding on many levels as people are open to diverse work and encourage dynamic thinking. There is so much vibrant work throughout the state. "Try not to explain each piece you complete....let it continue to evolve with each season of your life"
In one word, describe your upcoming show at The Arts Company. Click here to see Christine's artist portfolio. 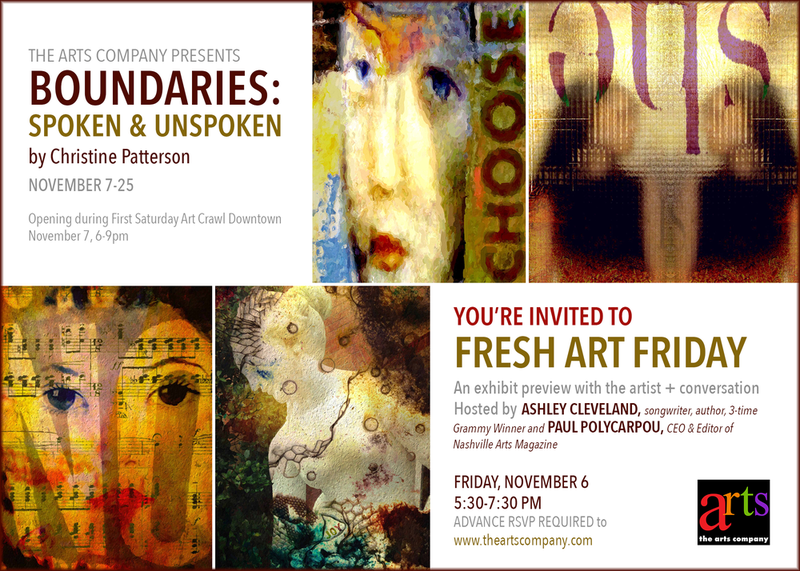 Join us for a special exhibit preview + conversation with Christine Patterson on Friday, November 6, 5:30-7:30pm.